All Creatures Great & Small [E1887] - $19.98 : Yarn Tree, Your wholesale source for cross stitch supplies. 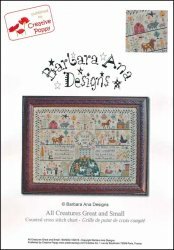 Cross stitch pattern from Barbara Ana Designs. This extraordinary piece by Barbara Ana Designs is exceptional by its size and unique in its wealth of detail. The inspiration for the piece is the verse from an Anglican hymn: " All things bright and beautiful All creatures great and small All things wise and wonderful The Lord God made them all". The design is indeed amazingly rich, covering a multitude of small scenes, landscapes and animals. Unlike most of Barbara Ana's patterns, the designer stitched the sampler first, then set off to chart it. You can feel the designer letting her needle take her wherever it pleased her and the huge excitement of creating such a large piece. Stitch count 317 x 248.